The Compass group is made up of artists, intellectuals, and walkologists. 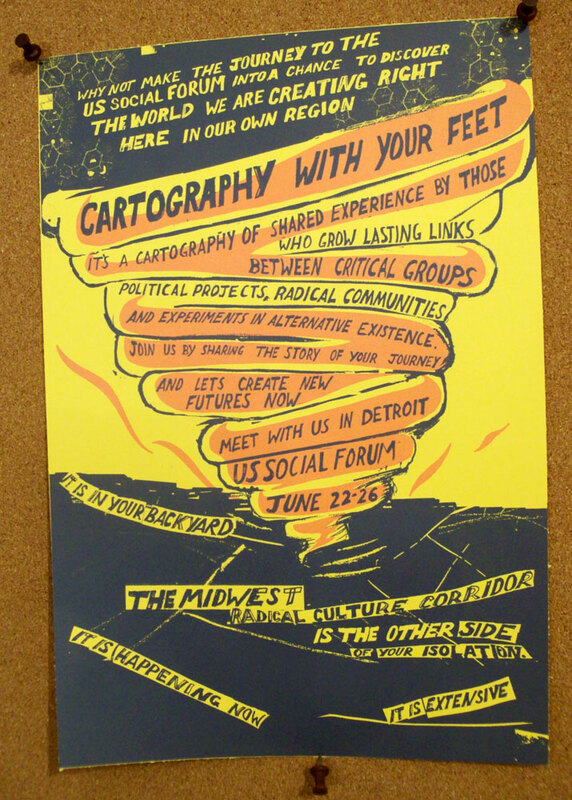 Acting together in a space around Chicago they call the Midwest Radical Cultural Corridor, they map a convoluted network of connections that shape global capitalism: political relations, economic transfers, and flows of information and people. Their politically engaged cartography makes use of many techniques developed at the boundaries of art, such as collective drifts, visual poetry, and emotional- and body- mapping of space. Compass engages these techniques for cross-pollination with other fields, such as social geography or political economics; as a result, it generates knowledge that extends beyond the limited frame of individual disciplines. As member/founder Brian Holmes has said, “It is not really art (or social science, or activism for that matter), but it could not really happen without art and social science and activism – so I guess it is all three!” This is how Compass traces the multidimensional diagrams of mapped space, taking into account their various physical, economic, social, legal, and political aspects. The exhibition includes a slide show excerpted from a cartographical essay “Southwest Corridor Northwest Passage,” which is found in its entirety online. It contains photographic documentation, travel journals, essays, and video materials, reconstructing the economic past and present of Chicago through the mapping of transport corridors, ports, canals, transhipment terminals, and rail routes that link Chicago with other global logistics hubs. The report presented in exhibition consists of six slideshows, combined into a single file and licensed by the Museum of Modern Art in Warsaw for the duration of exhibition. The original version of this work can be found at: www.southwestcorridornorthwestpassage.org. Courtesy Compass, Brian Holmes, and Rozalinda Borcilă.